Vapor shops generally have a lot of inventory that sometimes it’s hard to keep track of it all. What if we told you that a product had been developed with the vapor industry in mind that will help keep track of every single coil, e-juice, by Milliliter, atomizer and battery and will help reduce shrinkage? Produce your own juice- use the internal product labeling system to barcode, track and monitor inventory movement.. Well a product has. Welcome to the market the Profit SOS a vapor shop owner’s answer to their prayers. This product can become every vapor shop owner’s lifelong best friend shortly after being introduced to one another. The Profit SOS will help you keep track of your entire inventory and will even let you know when it is time to reorder products. By keeping track of your inventory you can reduce shrinkage. The Profit SOS also makes it easier to manage inventory between locations. 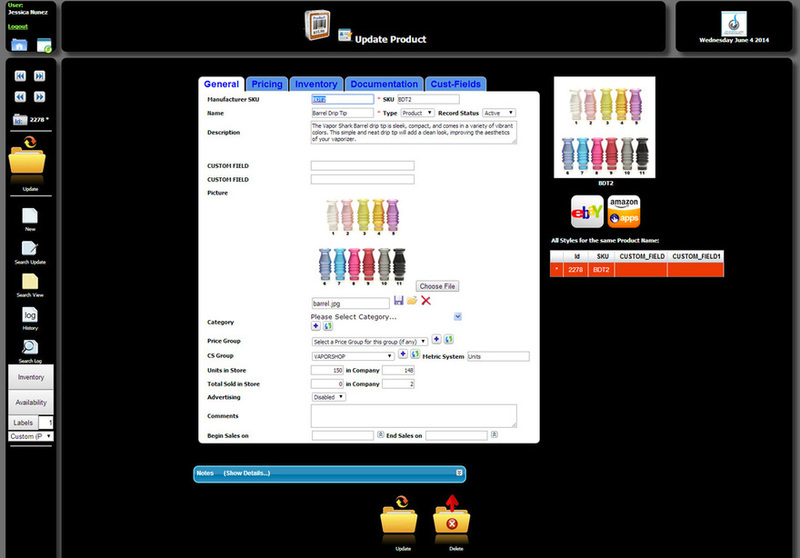 You can view inventory on a store by store basis or you can view the inventory throughout the company. If one store is out of a product your sales associates can just pull up the other locations where the product is located and text or email the directions to that store as well as a Google map of the location. The Profit SOS also helps vapor shop owners schedule employees in each of their locations. You can view who is scheduled where and even leave notes for the employees during their shift. You can ensure that your employees received their schedule by simply emailing or texting their schedule straight from the Profit SOS. With the Profit SOS you can manage your inventory, schedule your employees, view sales transactions by day, week, month or year and you can even see what your employees are up to by viewing your camera and you can do all of this from anywhere in the world because it is a cloud based system. The best part is that you do not need a fancy register in order to use the Profit SOS software. All you need is internet connection and the minimum requirements to run the software. You can use your own existing equipment, so start up cost is minimal. Most of the time a franchise is very particular in how a franchisee runs their store. They prefer everything to be uniform throughout all the locations so a customer cannot tell the difference between what is corporate owned and what is individually owned. The Profit SOS can help a franchise owner have maximum control over all the locations. They can see the level of inventory in each store as well as the inventory throughout the company. They can also see sales that each store generates and the sales that are generated company wide. By seeing the sales that each store generates the franchise owner can have a better idea of the franchise dues that the franchisee needs t o pay. When a franchise white labels the Profit SOS to their franchisees they will be able to ensure that everything is uniformed throughout each location. Also, when one location is out of a certain product the employees can see in which store that product is located. The employee can than text or email the direction to location with that product as well as Google map of the location straight from the Profit SOS which helps ensure that the company will not lose a sale. Most vapor shops do not get their products from only one wholesaler, they get them from several. The Profit SOS is an ideal way for a wholesaler to push their products. When a vapor wholesaler introduces their retail shops to the Profit SOS they will be able to see when their clients are low on their products and give them a friendly reminder call that it’s time to reorder. Also, the wholesaler can see exactly which products are selling which products are not selling. This will help wholesalers push certain products to new clients, letting them know which products are their best sellers in retail stores. Offering the Profit SOS to your clients is a cost effective way to add value to your services. As a wholesaler you will be able to offer a system that not only manages their inventory but their employees, their sales and practically their entire business for them. You will also be able to offer them accurate suggestions of best selling products and although the Profit SOS will do this automatically, you can give them a friendly reminder that they are low on certain products. Attending the World Vapor Expo at the Miami Beach convention center truly connected many of our existing clients to our team that has been serving them of the past years. Those connection have helped spur better relationships and plenty of referrals form other vapor industry regulars. "we have seen our business take on a new shape or organization using the SOS system"
"Their team support has been unwavering especially in the beginning when i needed them the most"
" their point of sale system has been very easy to use we got our location up and running within a day"